Hours: Sunday to Saturday: 7 a.m. to 10 p.m.
A unique and growing form of urban investment for many major cities like Brooklyn, Los Angeles, Seattle and San Francisco, public markets have finally hit San Diego. These hotspots of local eateries, fresh ingredients and innovative confections seem to be catering to the upper echelon — especially at the Liberty Public Market — but are nonetheless integral to the local dining scene and the “must see” travel list. 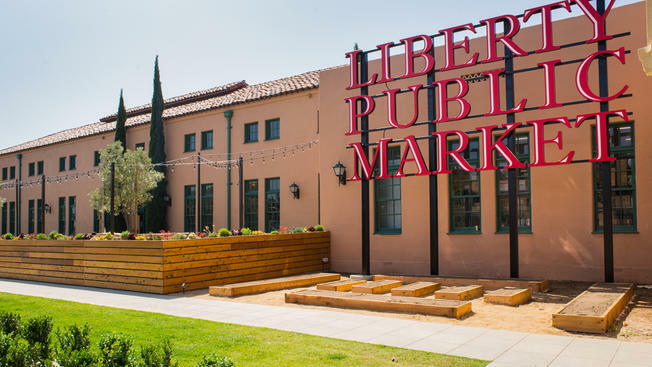 With a bustling environment, professional staff and overwhelmingly bourgeois consumer base, Liberty Public Market might seem intimidating at first, but nevertheless pleases the palate. 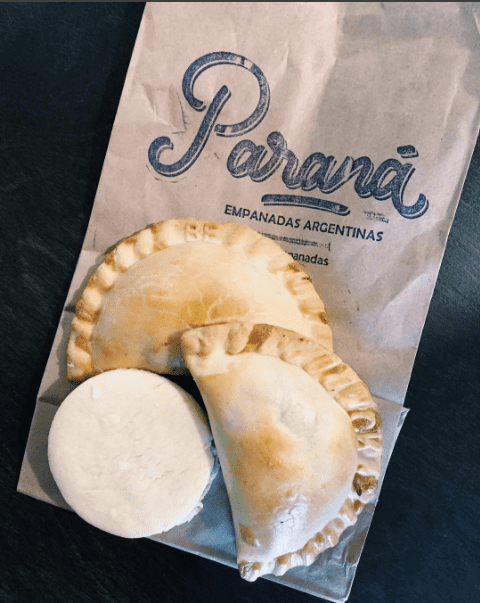 Don’t let the line intimidate you from Parana’s Empanadas Argentinas — these little pockets of sunshine are well worth the line snaking behind the glass display of golden pastries filled with assorted meats, vegetables and cheese. At $2.60 per empanada, these glorious Argentine treats are as delicious as they are affordable. And don’t let their sizes fool you, although smaller than the usual American portion, the empanadas are filled to the maximum capacity their delicately crisp pastry allows. Highly recommended is the rajas and cheese empanada, generously stuffed with roasted chiles, queso and corn while perfectly balancing spice and warmth. Beyond the taste, each empanada is hand-crafted and personally stamped with an initial indicating its contents — a unique and Instagram-worthy touch. Finish this experience with an alfajor, a paradoxically dense yet fluffy shortbread cookie sandwich stuffed with decadent dulce de leche and crowned with toasted coconut shreds. With seasonings atypical to the usual San Diegan diner, Parana is a trifecta of comfort food, intricate flavors and cost-efficiency. Aesthetically speaking, Pasta Design stands out with its variegated pasta and nice layout of San Pellegrino. Socially speaking, Pasta Design deserves to be praised for its commitment to using fresh products, even going down the aisle to the butcher to get its ground beef. When it comes down to taste, however, the pasta leaves you exceedingly disappointed. Advertising its lasagna as “the best lasagna in the world,” Pasta Design is shooting itself in the food(t) by letting the customer remember everything but the pasta itself. Sadly, the lasagna is layered in a way that strictly separates the ground beef and the cheese, while the pasta is soggy and saturated in water. Moving on from the lasagna, the other pastas and sauces tasted relatively gourmet, although not as amazing as advertised. Pasta Design has decent food that is slightly overpriced, but by expecting the best lasagna in the world, the puffery does not stand after the first bite. 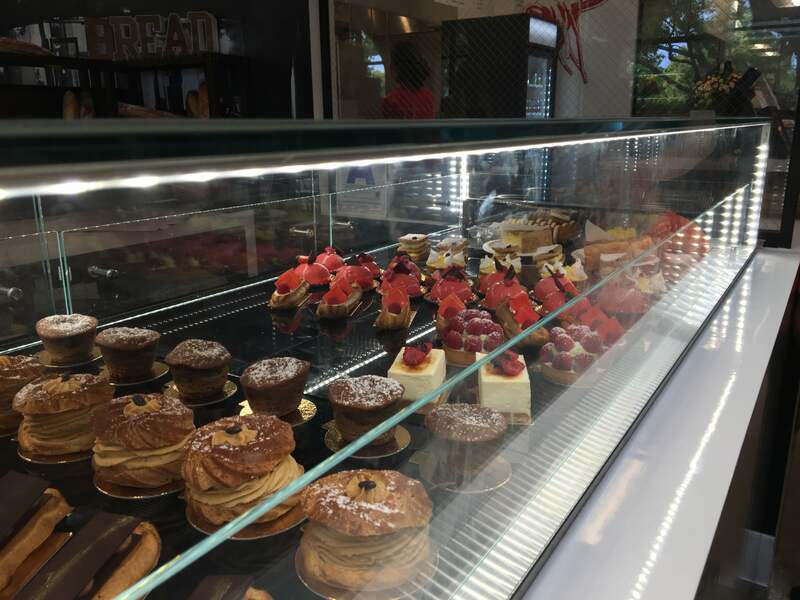 A little piece of France in the heart of San Diego’s bourgeois food market, Le Parfait is reminiscent of a corner cafe tucked away in a Parisian boulevard. Immediately, you’re drawn into a beautiful array of pastries — raspberry tarts dusted with confectioner’s sugar, chocolate domes rested upon spongy cakes and iconic eclairs glossed with chocolate. While everyone knows that there is always room for dessert, make sure you save some room for a prerequisite savory treat from Le Parfait. Rustic baguettes that crackle with each bite are stuffed with aged salami, fragrant cheeses and jams ranging from the usual strawberry to the more unusual fig, creating the ultimate flavor combination. And in the French way, accompany le course with a strong espresso or a frothy cafe au lait. Thai food is one of those cuisines, like Italian and Mexican, that seems almost universally loved. With dishes such as Pad Thai, Tom Yum Soup and Panang curry, it’s hard to make a bad decision. Finding authentic Thai cuisine, however, is not always as easy (sorry Hi Thai). Luckily, Liberty Public Market houses Mama Made Thai, which focuses on recreating street food with a healthy twist. Inspired by Bangkok’s diverse cuisine, Mama Made Thai prides itself on using family recipes, fresh and local ingredients and no MSG, to avoid that “greasy feeling.” With a large selection of appetizers, noodles, rice and soups, it is recommended to bring a friend, so that you don’t have to settle for just one dish. The UCSD Guardian tried the vegetable spring rolls ($6), Jasmine curry fried rice ($8) and the vegetable Pad See Ew ($8). While each dish was delicious, the Jasmine curry fried rice takes the cake, with its menagerie of spices, sprinkling of raisins and vegetables, creating a complex flavor combination. Would recommend, 8.5/10. If there’s one thing you don’t mess with a San Diegan about, it’s beer. The beer culture in SD is intense — you’ve got your Ballast Point, Modern Times, Green Flash, Stone, to name a few. It doesn’t really seem to matter what time of day it is, San Diegans take time to enjoy a good beer. 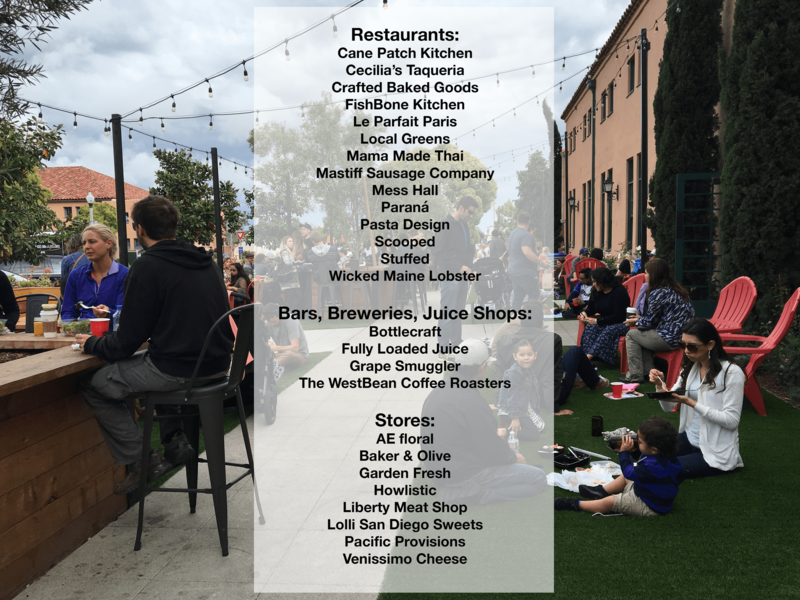 It’s no different at Liberty Public Market, where at any given moment, cool dads, grandmas and hipsters alike can be seen enjoying a cold one while strolling through the market. After a little detective work, the Guardian found the source of the red solo cups at Bottlecraft, a beer-tasting room within the market. With an extensive selection of local San Diego beers, it might be hard to just pick one. If that’s the case, the Guardian recommends taking advantage of the $2.50 for four-ounce pours, and sampling a few. If four ounces just don’t cut it, there are eight-ounce pours for $4.50 and 16-ounce pours for $6. The Guardian sampled the Almanac Saison, a strong, pale Belgian ale with a dry finish and the Pizza Port Shark Bite, an Amber Ale with lots of hops. Both beers are 10/10, would recommend. Owners of food trucks and small food joints have long realized that anything can be turned into a street-food dish if put in a piece of bread. 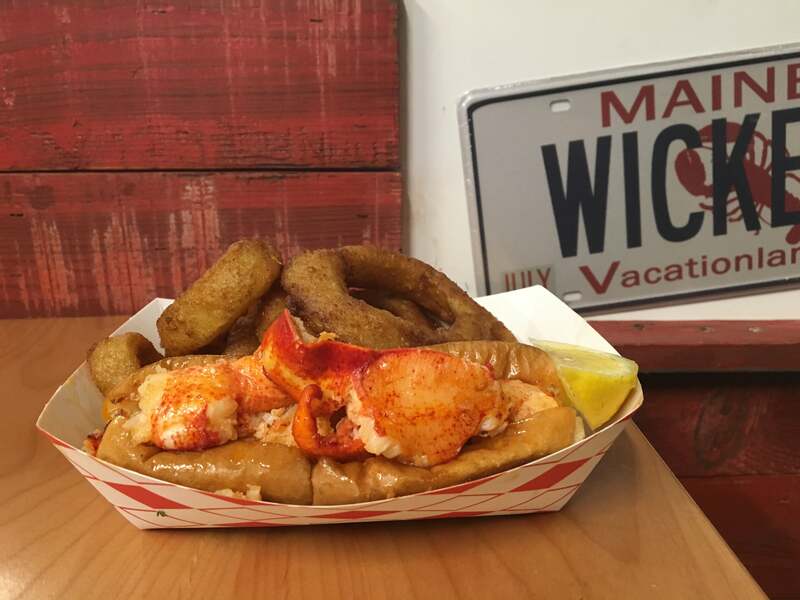 No surprise Wicked Maine Lobster decided to bring their fresh-caught lobster — seafood that one would not normally see as street food-affordable — in the form of lobster rolls to farmers markets and fairs across San Diego. Deliciously buttery and tender, Wicked Maine lobster rolls are served warm with butter or chilled with mayo. Regardless of what option you choose, you are guaranteed a filling sandwich with ideal lobster-to-toast ratio and a side of fries or onion rings (unfortunately, you do not get to choose between the two). Generously stuffed with big juicy pieces of lobster meat, this dish comes for a price of $16 — a sum $4-5 lower than at seafood restaurants, but arguably higher than what you expect to spend on a market meal. While the lobster roll is a Wicked Maine Lobster staple, its new menu features more traditional seafood dishes — Maine Lobster Taco with pico de gallo and New England clam chowder (one for $5 and three for $13), Lobster Mac N’ Cheese for $12, gluten-free New England Clam Chowder for $8 and lobster bisque for the same price. Eatery owners have also introduced two other kinds of signature rolls — the crab roll ($12) and shrimp roll ($10) are well-priced alternatives to their lobster relative. Still hungry for that lobster meat? Wicked Maine sells fresh-picked lobster meat for $45/lb that can become a gourmet addition to your family dinner.